NEMA 23 frame size integrated BLDC servo motors. 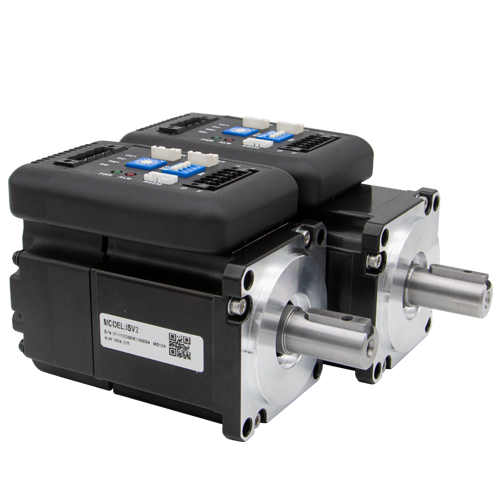 At very compact sizes with motors and encoders and servo drives integrated together, they can output power up to 180W and run up to 4,000 RPM. Minimized wiring time, low costs, easy to install, and smooth motion movement. NEMA 23 Brushless DC servo motors of rated power range of 25-180W. Rated speed 3000 RPM and peak 4,000 RPM; integrated two channel (A, B) 1,000-line incremental encoders; high precision, low motor noise and low heating, low cost. Leadshine 50 to 120W brushed DC servo motors of 54 mm and NEMA 23 frame sizes. Integrated 1,000-line encoder resolution. Those servo motors can move smoothly in high precision with low motor heating and extra low noise. Leadshine ACS brushless DC servo drives designed to power 25-400W BLDC servo motors. Maximum supply voltage 80 VDC, output currently up to 20A. Step & direction and CW/CCW control types. High performance, easy to setup, low cost. Leadshine digital brushed DC servo drives based on advanced DSP control algorithm. They can power brushed DC motors with continuous power up to 400W. Taking step & direction control and CW/CCW control, they are easy to implement for OEM applications. High reliability, easy to use, low cost.